Walt Disney Concert Hall is one of my favorite wedding photography locations in all of Los Angeles. And although I have photograph couples there more times than I can count, I'm always finding someplace new to create an original photograph. That being said, there are some locations that I visit time and time again working to improve my past photographs at that same location. No photograph is perfect, and with that in mind I commonly revisit certain locations and try different compositions, posing positions, and utilize different lighting..
For this couple, I position them in a location that I use almost every time I visit Disney Hall. However I feel that what makes this image particularly special for this location, is the composition. I particularly enjoy how the camera position next to the right wall serves to move the viewers I to the curving line of the wall as it leads into the couple. 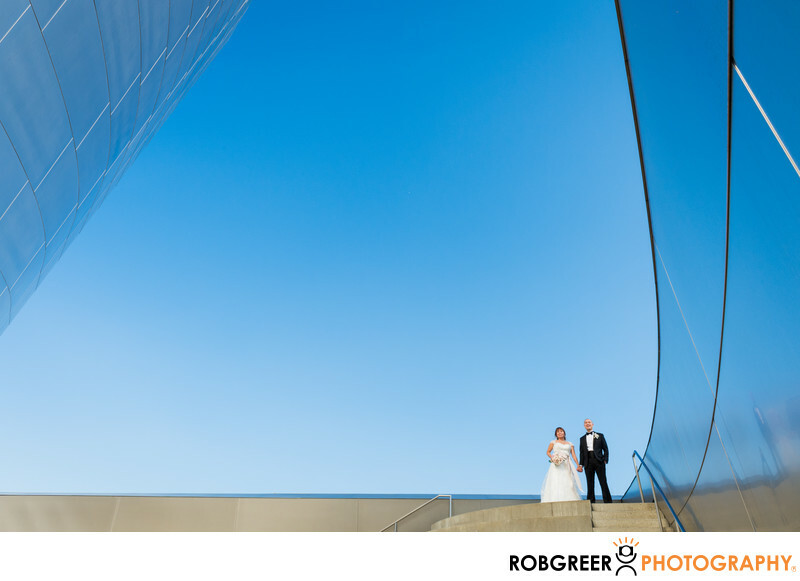 Additionally, as this wedding photograph was taken in bright sunlight, the absolute perfection of the well-lit couple combined it with the deep blue sky and the brushed stainless steel walls of Disney Hall coming together leaves me breathless. As I move forward in my career and continue to photograph couples in this area, you can be certain I will revisit the spot. And although I am very well please with this image, I will constantly strive to improve and perfect what can never be perfected. 1/400; f/10.0; ISO 640; 24.0 mm.